A jaunty yet disquieting tale of the first American prosecution of a Chinese software pirate. Hall, a federal prosecutor and Naval Reserve intelligence officer, was nearing retirement in 2010 when Homeland Security investigators directed him to CRACK99.com, a website, "amateurish and even juvenile in its presentation," offering high-end aerospace and engineering software with clear military applications for pennies on the dollar. Intrigued, he made contact with webmaster Xiang Li and began making purchases in an escalating undercover investigation. Hall plays Xiang Li's evasive, linguistically challenged communications for laughs ("This is the perfect sure! Trust from our services") while emphasizing the serious national security implications of such piracy. He notes that unenforceable indictments had been issued against Chinese army officers for similar activities. 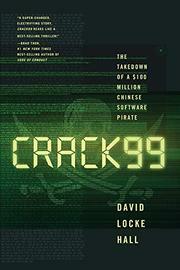 "If we failed,” he writes, “investigating CRACK99 would [also] go down as a fool's errand, and we would be the fools.” Although Hall was unable to link Xiang Li to the Chinese government, search warrants for CRACK99's email revealed that the gaudy website was selling "hundreds of different software programs…originally produced in the United States" to customers in locales including Syria and China itself. The case followed several surreal twists, culminating in Xiang Li's apprehension on Saipan, an American protectorate; Xiang Li was ultimately sentenced to 12 years, and some American customers were prosecuted as well. Hall takes a prosecutor’s perspective, noting, “ironically, U.S. technology enables the Chinese to steal U.S. technology with relative ease…[using] the Internet as an efficient method of theft.” The author writes in the familiar voice of a blustery, world-weary top cop; his observations as the case unfolds are often humorous but can also be repetitive. While many, including Xiang Li himself, portrayed such software piracy as a harmless libertarian impulse, Hall believes he's sounding the alarm about a metastasizing military threat: "The use to which China will put this stolen [American] technology is anyone's guess." A quirky tale of international pursuit through a legal labyrinth with unsettling implications regarding proliferation of ominous technologies.